You may ask where did Peugeot come up with the name 2008 for its new, and most attractive SUV. It is a stretched version of the current 208 saloon. That is to say this so-called ‘utility’ vehicle is 186mm longer than the hatchback or just over 7”. It is ‘stretched’. The Editor in Chief reports. With the 2008 Peugeot has followed its now standard practice with three standards of fittings, Active, Allure, and in the case of the test car, GT Line. On the road prices start from £16,300 to £22,130 the price of the press fleet model, which also had added Pearlescent paintwork (£645), heated seats and leather trim (£500), and the Active City Brake at £250. 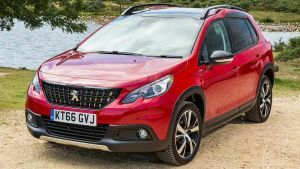 The 2008 is in a very lively part of the market and does not compete with the larger (and much more expensive) Nissan Qashqai and Seat Ateca, which are left to its big brother the 3008. The awareness question for the 2008 is its height at 1556mm (5ft 1 inch) v 1460mm (4ft 7inch) of the saloon version. It just seems a much bigger car than it is. It contests an area of the market that includes Citroen C4 Cactus, Renault Captur, Kia Soul and Nissan Juke. It is a family friendly car with lots of places to store, ample room in the back for three children, perhaps less so for three adults. It rides nice and whilst never going to win the traffic light GP, is very quiet at 70mph the GT easily giving 50mpg. One thing to make clear. Over the last decade or so Peugeot have come a long way in terms of quality, the 2008 giving the feeling of being well put together, with nice cloth materials, and leather trim with the press car, and good quality plastic for the fittings. It is certainly not ‘utility’. First introduced in 2013 the 2017 model can be distinguished by a new frontal appearance and various bodywork updates. It has enjoyed continuous growth in sales volumes, with production of over 500,000 units worldwide. One good and one bad thing stand out. Firstly the simple but effective sat nav head-up display on the instrument panel (standard on the GT Line) offers the driver all his direction information whilst still looking ahead, a real safety feature. It is part of the Peugeot i-Cockpit concept bringing ergonomics into the driving. There is a 7” multifunction colour touch vision and even the steering wheel design has come in for some thought. It is intuitive, agile and makes the car feel very safe. My gripe. For me the manual tailgate was hard work. Perhaps I am being spoilt but recent test cars all seem to have an auto facility. By automating parking manoeuvres, Park Assist highlights the 2008's compactness to facilitate trips into town. Once the feature has been activated, the driver selects the type of manoeuvre required on the touch screen (parallel parking or exiting the parking space), after which the ultrasonic sensors measure the dimensions of the available spaces to notify the driver of a suitable location. Park Assist then guides the vehicle via a steering management system, and all the driver has to do is view their surroundings and control the car's progress. The reversing camera displays the area behind the vehicle on the screen using colour guide lines. Pulling out of a parking space is very easy by using the intelligence of Park Assist again, even on a sloping street due to the Hill Assist feature (which temporarily applies the brake). It takes strong nerves to use the system at first, but once mastered is a joy to use. To enhance safety in urban areas, the 2008 is equipped with Active City Brake – a new technology which makes it possible to avoid an accident or reduce its seriousness if the driver fails to react. It works in urban conditions at speeds of less than 20mph. A short range sensor is fitted to the top of the windscreen and can detect other vehicles that are driving in the same direction or stationary. This will automatically trigger an emergency brake to stop the vehicle and avoid a collision entirely or limit the consequences of an accident by reducing the speed of impact. Another practical item is Grip Control – an adapted traction system – gives the 2008 its versatility on all types of terrain. It is combined with Mud & Snow (all-Season) certified winter tyres. A wheel between the occupants of the two front seats gives various settings. It comes as standard on all but the basic cars. No muddy fields around during my week to test the system. The 2008 offers a choice of petrol and diesel engines with a power output from 82hp to 130hp, and in an excellent six-speed manual form, or an automatic which I did not try but if the 208 is anything to go by, works well. The new GT Line trim adds a very sporty and chic theme to the red/black spirit. This trim, common to the entire range, is consistent with the brand's move up-market. 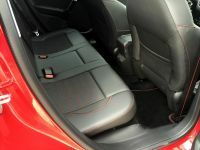 The split rear seats mean the boot volume can vary from 410 to 1400 litres very quickly. On-board connectivity includes the Mirror Screen feature which allows the driver to link an Apple Carplay with voice activation or MirrorLink compatible smartphone to the touch screen. A reversing camera is standard on all but the basic car and that package includes electrically folding front mirrors.